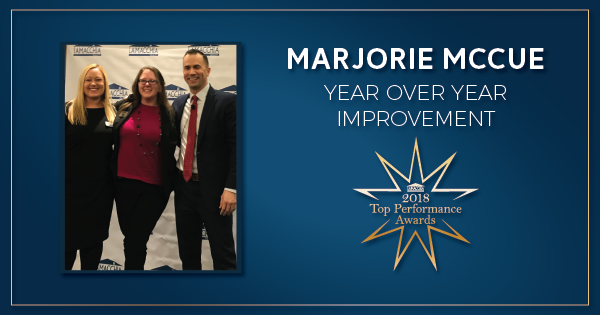 January 17th, 2019 – Lamacchia Realty is proud to announce Marjorie McCue as the 2018 winner of the Year Over Year Improved award. “I am very proud to see Marjorie doing so well. 2018 was the year it came together for her and know she will do even better in 2019! She is also someone who is a joy to have in the company as she is always a team player and everyone enjoys being around her,” said Anthony Lamacchia, Broker/Owner. She went from 2 sales her first year in 2017, when she was making the transition to full-time, into 10 sales in her first 2 years here at Lamacchia Realty. We evaluate this award on a Lamacchia agent in their first two (2) full years at the company. Marjorie recently was awarded the Top 3 Producing Agents by office in Woburn for the month of November 2018. To learn more about Marjorie, click here!